Tired of mere fried fish? 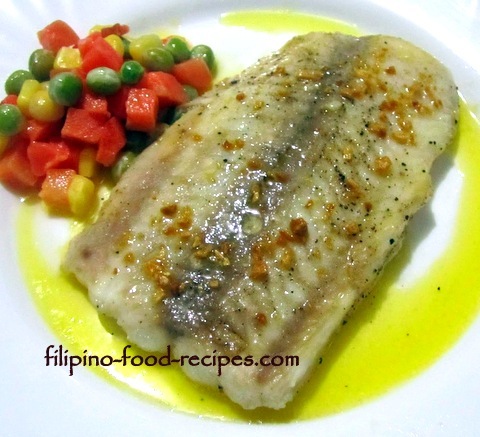 Try this Fish Fillet in Lemon Garlic Butter Sauce for a change. Don't worry, the recipe is pretty straightforward. The fish fillets are seared on both sides in oil, then a lemon, garlic and butter are warmed and mixed together vigorously to emulsify. I use an empty mason jar to shake the sauce to thicken the butter and mix well with the lemon juice. I use Cream Dory so it is affordable, but you could use any kind you want. And the mixed vegetable is optional, but it certainly completes the meal. Blanch or cook the vegetables briefly in boiling water and drain to an ice cold water bowl to stop cooking and retain its crisp texture. This is so quick and easy to make, and best of all, it tastes fancy. 1 Season the fish fillets with salt and pepper and sear in medium hot oil for about 2 minutes per side, or depending on the thickness of the fish. 2 In a separate pan, melt the butter and add half of the garlic, lemon juice, salt and pepper and just slightly heat up. Remove from heat. 3 Pour the sauce in a mason jar (garapon) with a tight lid, and shake vigorously, or if available, put in a blender to mix thoroughly to become creamy. 4 In a separate pan, fry the rest of the minced garlic in oil, then set the garlic aside. Use the same pan and saute the blanched vegetables. 5 To assemble, for each fish fillet, top with fried garlic and pour around 2 tablespoon of lemon garlic butter sauce. 6 Put the mixed vegetables on the side. 7 Serve with steamed white rice and enjoy!